The TENIOS Voice-API is a web-service API that lets you build communications applications that run on your servers and drive the TENIOS platform using common web technologies. The cloud-based IT landscape changes the way of developing and hosting applications. Open and standardized interfaces replace old-style proprietary software and hardware solutions. Cloud computing is the new model of processing resources and providing state-of-the art applications. So far running applications in combination with telecommunication services required separate telco platform, which has to be operated separately. These are own PBXs or servers with ISDN-cards, which occupy extra resources. In addition to their main mission, development / operation of applicatons, developers and company IT required to develop, understand and maintain telecom systems or VoIP protocols (SS7, SIP, etc.). It comes as no surprise that the web/cloud applications and the telephony spaces have remained separate fields. Thanks to Voice-APIs applications can be connected to telecom services with open and standardized interfaces of cloud communication providers like TENIOS without the need of running own telco platforms. A Voice-API - also Speech-API - is a set of functions that allow a software application to initiate and receive calls without requiring the application developer to know details about telecommunication technologies and protocols. API providers like TENIOS interfaces between the software application and the telecommunication provider. The application, in the context of Voice-API, defines how calls will be handled and created. An application can be as complex as a call center solution routing thousands of calls from customers worldwide to technical support teams at multiple locations or a conferencing service for business. Setting up a traditional call center involves deploying hardware and software, as well as knowledgeable technical staff to manage, configure, and maintain all the systems. With Voice-API’s it becomes possible for application developers to create call center solutions on the cloud without specific knowledge on the telecom infrastructure. By leveraging the APIs, developers can create scripts that answer the phone, identify what the caller needs, and bridge the call to customer service representatives. The focus and effort shift from the mechanics of connecting phones to the business logic of the solution. Because the solution is entirely software-based, call flow logic can be easily integrated with other systems such as CRM and ERP. 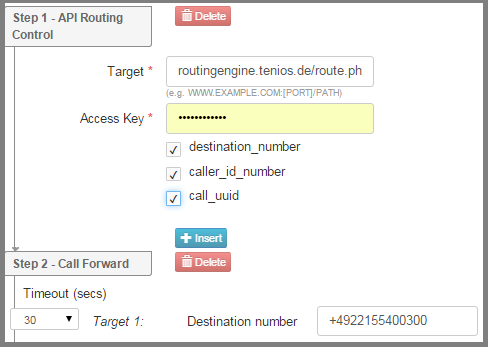 Solutions can route calls without requiring endpoints to be at the same location. As a consequence, we observe a new generation of cloud-based, virtual call center solutions in the market. Receive Incoming Calls The Voice-API provider will receive calls and notify your application, which can decide how to handle them. For example: play message, enter IVR menu, or bridge to another phone number. 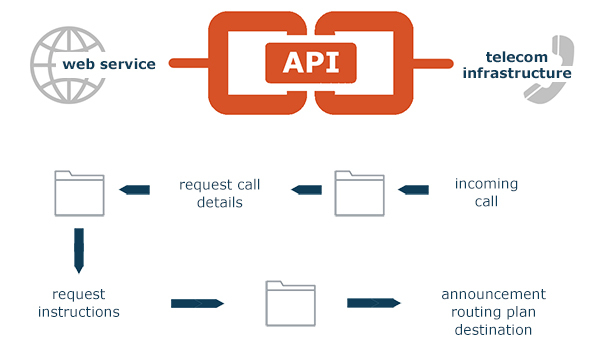 Outbound Calling The Voice-API platform will call a particular number based on instructions from your application. If call is answered, platform will ask your application for instructions on how to connect it. Bridge Calls The Voice-API platform will bridge two calls. This let you set up calls between two end points under the control of your application. Convert Speech to Text or Text to Speech Enables programmatic interpretation of voice, which can be used for personalization of messages or automation of voice dialog scripts. Record Audio Let you record audio from phone calls. Voice-API’s do not create new telephony functionality; they just make it easier for developers to access telecom Features. The TENIOS developer web-API is a web-service Voice-API that lets you build communications applications that run on your servers and drive the TENIOS platform using common web technologies. It uses the same request-response model many web developers are already comfortable using, communicating with applications running on your own server, feeding requests and processing responses back and forth as needed. The Voice-API is particularly useful in situations where, for example, you need to use a custom library (or libraries), or need access to a database. The Web-API allows for the deep backend integration you may need, but does, however, require you have your own infrastructure, your own hosting, and your own servers already in place. You can respond with actions such as playing a file or a tone, recording a message, or transferring the caller. Combine this with your own database or infrastructure and you have an extremely rich and powerful call processing tool.